The end of September and the grizzlies are looking ready for hibernation. They have added the necessary body fat to survive the winter but are still coming to the area of the viewing stands for another meal. 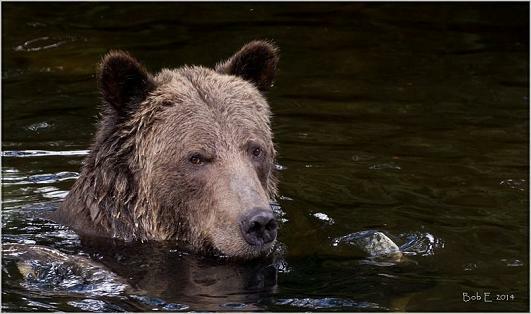 The fat bears are selective in what they eat, mostly eggs and belly fat while other are after the whole salmon. 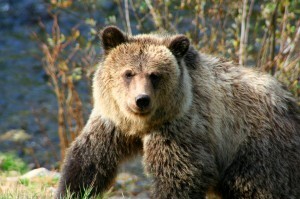 This grizzly was one of the selective feeders and more interested in a viewing platform of clicking cameras than food. Glen, one of our guides, provided this photo. This grizzly bear uses the same method as the cub from yesterday’s posting. She sits in a deep (1 to 2 meters – 3 to 6 feet) area of the river and picks up the dead salmon off the bottom. She does not even bother to look into the water but rather reaches down and pulls up salmon until she has one that meets her criterion of eatable. The calorie value of salmon does not change if it is several days old but the amount of calories burned to catch the salmon makes a difference. The grizzly bears of central British Columbia do not have this source of food to fatten for the winter so “waste not want not” seems a good policy.